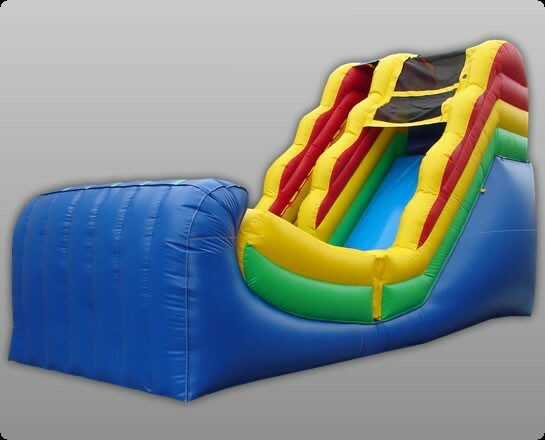 The 16' Rainbow Wet & Dry Slide is a great unit for your rental business, Church, or institution. The 16' Rainbow Wet & Dry Slide is a great unit for your rental business, Church, or institution. Made of heavy duty commercial grade 18oz reinforced PVC Tarpulin material. Our KidWise Units are backed with a One Year Warranty against material defects and workmanship. All of our Wet and Dry Slides feature landing zones with curved stop walls. This half-pipe inspired design gives the rider a new experience as they come to a gradual stop after sliding up the back wall. Designed with safety and year round fun in mind, you'll want at least one Wet and Dry in your fleet. Rated for 4-6 Users and a 600lb capacity.